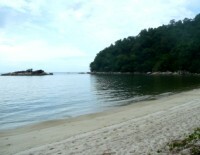 Teluk Duyung, known as Monkey Beach Penang, is located in Penang National Park in the north-west corner of Penang Island. So-called because of the Crab-eating Macaque's that live around here, the beach is one of the nicest beaches in Penang Island, with a long stretch of white sandy beach that is good for swimming. 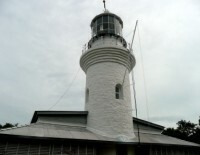 Teluk Duyung is a popular place to visit during weekends and public holidays when many locals will come here for the day by boat to enjoy a picnic on the beach. Head here during the weekdays and it is much quieter. For those wishing to camp at Monkey beach, there is an official campsite near the beach. There is no road access to the beach, so you either have to charter a boat from the entrance to the National Park at Teluk Bahang, which will cost you around 50 RM (per boat) or you can walk along the coastline through the National Park. The walk / hike in is just a bit less than 3 and a half km and takes most people under a couple of hours, but can be done quicker or much slower depending on your fitness and how many times you stop. 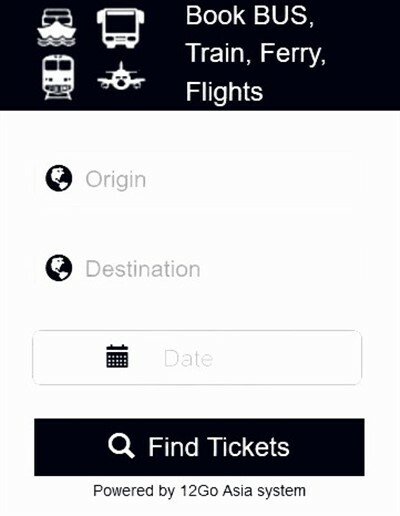 Another option is to go on a sightseeing tour / excursion where everything is included (transport to / from your hotel / boat / guide / lunch). If you are staying in Batu Ferringhi you will usually be approached by a number of boatmen trying to take you out to "Monkey Island." It is not an island - just a selling point to get you on their boats! If you want to go by boat, it is better to first catch the bus to the National Park entrance where you will find many boats available for charter, at a much cheaper price. 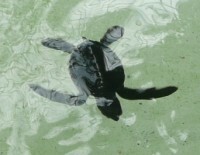 To get to the National Park entrance, take bus number 101 from Georgetown Jetty, Chulia Street or KOMTAR. This same bus can also be caught from Tanjung Bungah beach or Batu Ferringhi beach. Get off at the last stop, where the bus turns around. 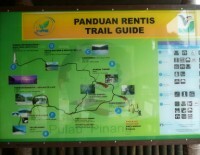 After registering at the parks office, enter the park and just follow the path along the coastline (flat and easy) for 1 km until you come to Sungai Tukun, where the path divides into two. Turning left here would take you on a short walk to the Canopy Walkway (Titian Kanopi - Note: you have to purchase Canopy Walkway tickets before you get here at the registration office) and eventually up over the hill to Pantai Kerachut (Kerachut Beach). 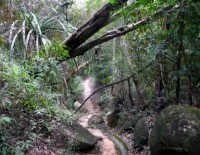 After Sungai Tukun the pathway becomes a jungle path, so is a lot harder to walk along, going up and down over headlands with a few rocks and fallen down trees to negotiate. Nothing too bad, but if you are totally unfit it could cause you a few problems. 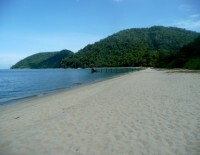 After about 30 minutes you will reach the USM beach (Pantai Teluk Ailing) where the USM Research Station is located. This beach is usually totally empty so a good place to stop for a while and maybe take a swim. The trail starts again at the end of the beach. Again it's just a fairly narrow path through the jungle with a number of headlands to go up and down, but this section is much longer at 1 3/4 km and will take you around an hour to negotiate. 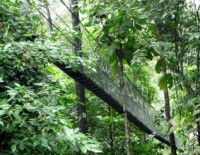 For more general information about Penang NP and what to see here, please visit our National Park page or you can view our Pictures of the National Park page.